Not many players remember the time when the game just appeared and the developers just started adding new content. The textures looked very simple and bright at that time, and MC players did not even suspect that MCPE would turn into such a popular giant. Today, when the textures are modernized so much as it can be pleasing to the eye, one of the fans released a nostalgic pack that includes those old textures. Support for Minecraft BE 1.9 (+1.7 and 1.8). At the moment, Nostalgia Craft PE consists of most of the original textures created in the early versions of the game. These are very bright and uncomplicated textures that have been replaced with darker ones to reduce the burden on the eyes. How to install the Nostalgia Craft PE? 1. 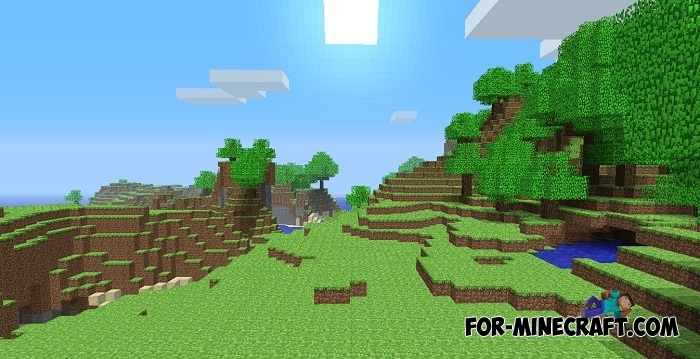 Download it and run Minecraft. 2. Go to the game settings and activate the pack or do it in the map settings. This texture pack is great for the old school players like me, like wow I’m still playing this game after 7 years some retarded little kids that play this game weren’t even born when I started. In my opinion this game just gets suckier with each update adding in pointless changes and useless new things I never ASKED for and for people who don’t play minecrap, the game looks childish to the outside world like look at some of the cringe YouTube videos about this game where little kids are singing crappy song about the game or some stupid animation. But with this texture pack I finally get MCPE v0.4.0 the version I started on yes, it really meant to look like pc edition but, it can also look like old pe versions, this pack takes away the new sucky feel to it but, it doesn’t remove the new sucky swimming mechanics or the regipe book but, it’s still better than nothing.